Self-catering holidays shouldn’t be hard work and there is a good choice of places to eat within easy reach. 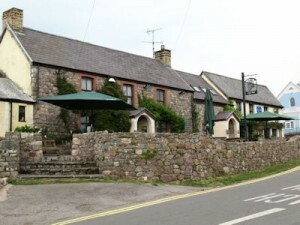 The King’s Head (www.kingsheadgower.co.uk) is right on the doorstep, just a very short walk from Barcud Lodge, so no worries about driving. They serve real ale from the local Gower Brewery and typical pub food, much of it locally produced and home cooked, as well as a range of ‘specials’. Curries are a particular speciality and Tuesday curry nights are always popular. Eddy’s Café at Hillend Caravan Park is open from Easter to October. Tel 01792 386606 to check opening times. Dafydd at Blas Gwŷr (the B&B next door) runs Café Hâf in the summer, serving light lunches and snacks, tea, coffee and home made cakes. Blas Gwŷr means ‘Taste of Gower’.